The kids are gone, the house is too big, and we want a change! Does this sound like you? Let me add to this if I have yet to describe you. We each have Graduate Degrees, Sue as a Nurse Practitioner and Clinical Professor, and, me (Tom) as a Hospital Administrator. We have been in health care for 30+ years and I am no longer excited by long hours, corporate intrigue and a great income (pre-tax), and she is no longer enamored with early morning clinics, late night paper reviews, and income that is not commensurate with her commitment. Sounding familiar? Sound like you? Read on. In October of 2004 after considerable research, visiting alpaca ranches, attending alpaca business seminars and drafting business plans, we purchased two maiden females and in November we purchased two pregnant maidens— we're in the business! Well sort of, we next had to find a place to put them! Sue has always had the better eye for the potential of a property and after having looked at literally dozens of properties, she convinced me that she had found the perfect place: 4300 Hansen Road in Loomis CA. We bought it and in January of '05 moved in to the future home of "Alpacas All Around." The first order of business was to design the farm layout: how should the paddocks be oriented, what kind of shelter would we need, where should the shelter be sited, how would we move the alpacas from one paddock to the other with minimal effort? After dozens of drawings we came up with a plan that appeared to meet all of our needs—now finding someone to build it. That person was Lyndon Short. Lyndon is a master builder, familiar with farm systems for sheep and cattle, and very patient—perfect for two novice alpaca farmers. We explained to Lyndon that key for us was ease of animal movement and animal separation. Lyndon took our simple plans and turned them into something that we believe is unique and perfect for us. A 40 x 60 pole barn structure, fully enclosed on three sides, with a four foot high wall on the remaining (West) side, with loafing areas on three sides. The barn has an office/vet room, hay and grain storage, 6 pens and the ability to move animals from one end to the next by simply opening and closing gates. We also designed a weighing station between two of the pens to make routine weighing easier. We now have nine alpacas, six adults and three cria, two more cria are scheduled for mid November and a third in May of 2006. The barn is now complete, as are all of the paddocks (11 total). It's been a little over a year since the animals arrived. We and the girls are very happy with our completed barn and pastures. With all of the storms and rain last winter, all were comfy, warm and dry. My only complaint: they turned one of our stalls into a poop box! We have not been able to stop that, but we have discovered that framing a small area with 2 boards, they do make every attempt to confine their droppings to the designated area. Notice that I always refer to our animals as "girls". That is because; we have had a tremendous year - 5 crias, and 5 HEATHLY FEMALES!! We have had our trials; not making sure the cria got all of the colostrum needed within the first 6 hours, so off to Michelle Ing DVM for a transfusion. But what the heck, what's a few hundred bucks when you are talking about a $20,000 animal? The older girls are now rebred. We are anxiously awaiting our fall birthing season, with offspring from ½ Accoyo male, Snowhawke, and the luscious black Cherry Garcia of Alpacas del Valle Cereza, Royal Cappuccino of Spring Hill Alpacas, and Sir Cinnamon, the gorgeous son of the legendary 4Peruvian Legacy. 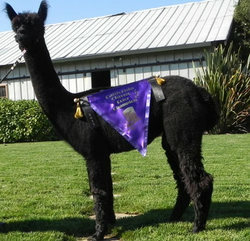 As we started having cria, we pondered over how we would come up with distinguished and meaningful names. As I watched the irises of "Yarda's Ditch Water Iris Farm" bloom from my kitchen window, I learned that irises have registered names the same as alpacas. So, we have decided to name each cria after an iris. Hence the names, Princess of Pandora, Devenshire Cream, Winter Pearl, Yosemite Sam, and Chelsea. We will plant an iris for each cria born with the same name. When the cria sells we will provide the new owner with an iris of the same name as a token of our appreciation for their business. Additionally, we will always have a way to remember the miraculous cria that have come into our lives. It has also been great having a means to integrate our new life with that of our new neighbors, Eric and Yarda Hansen. We will be forever grateful to our mentors in the alpacas business. When buying our first alpacas we put our faith into Lisa Shimeld and Brad Johnson, (Alpacas del Valle Cereza) to find us the very best animals for our money, and that they did. Dennis and Bea Miller (Alpaca Palms) were incredible in showing us the ropes at the shows and making us feel safe in this new and sometimes scary life of alpaca farming. Nat and Jeff Bromstead of Alpacas de la Luna graciously gave us the opportunity for hands on experiences before our girls came home. Kevin and Lisa Newsome of Black Pearl Alpacas have always been there to share the hiccoughs and laughter as fellow newbies in the business. And last, but not least, our amazing vet, Michelle Ing. We are truly blessed, and spoiled, having the best camelid vet in California live so close to us. Our animals are extremely healthy, and receive the finest medical care whenever the slightest problem arises. 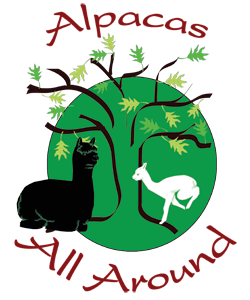 Since joining our local alpaca group Alpacas Gold Association, we have become part of an incredible supportive family, who provides us with constant ways to learn and love these breathtaking creatures of South America. Life has been great with Alpacas All Around in year 1. Our original plan of breeding for color to develop a superior herd of primarily black and white alpacas is becoming a reality. Our second successful and profitable birthing season, gave us two females, and two males. Our new females: Vanity's Child is white; Brandy is a bay black. We finally had our first male. And then were lucky enough to have a second to keep the first company. Our first white male, we named Skyhawke. He is from the stately sire, AVC Snowhawke. The second male, a luscious deep dark brown, came from our black dam, Raindrop. His name is Reignman, and he is out of AVC Domingo. With their genetics, and all those curly shiny locks, they both show promise as future herd sires. The only down side of this story is that all of our purchase breedings are used; we have 10 breedings to pay for this year. OUCH!! Our attentions are now aimed towards making breeding decisions that will enhance and improve the quality of fleece with each generation. We are off to a great start! We still have much to learn and accomplish. Because there are so many opportunities to gain knowledge and advance in this business, it is hard to get discouraged. We have already enjoyed many fruits of our labor. For the first time in years, instead of writing a big check in April, we received money back from our taxes! Agisting and providing birthing services paid for a lot of hay. Our girls have grown and are now ready to be sold. Being a fleece industry, we are presently challenged with keeping the burrs out of our pasture, and from taking over our animals' fleece. Hopefully, lush pastures and lots of mowing, will take care of that this year. Witnessing the miracle of birth is always mesmerizing. Out of 9 births, 8 have been healthy crias. We had one severe dystocia, but caught it in plenty of time to get to Dr. Ing's and deliver a fantastic female cria. Once recovered from the traumatic birth, both mom and babe have done well and mom is again pregnant. I have started making my own cria coats, with longer belly bands so the cria don't grow out of them so quickly. Last summer I put 2 of our yearlings in the van and drove to Bend, Oregon, to attend a 4 day Marty McGee-Bennet clinic. I will soon have my Camelidynamics Handler Seal to display with pride on the web site. Showing has not been a priority because most of our herd is pregnant, but we have gone to 2 shows. Our "wall of fame", which shows off all those ribbons and trophies, is still in the planning stage. We do have a small handful of ribbons to get it started. Tom and I are enjoying participating in many alpaca functions of our local and state organizations. It is a pleasure to become involved with the people in this business, which because of their varied backgrounds, make this industry so rich in knowledge and expertise. We are looking forward to many productive years ahead.